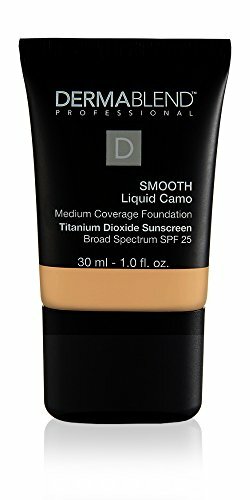 Dermablend Smooth Liquid Foundation with SPF 25, 1 Fl. Oz. This smoothing liquid foundation provides seamless, even coverage for up to 16 hours of consistent smudge- and transfer-resistant color wear —when set with Dermablend Setting Powder. Formulated for the most sensitive skins across a diversity of skintones, it provides all-day hydration and broad-spectrum SPF 30 for ultimate skin protection. Featuring high-performance pigments, this ultra-blendable texture has twice the coverage of a classic foundation to address skin concerns including hyperpigmentation, uneven skintone and redness. With a flexible texture that’s never cakey or masky, skin appears beautiful and healthy-looking. dermatologist tested. allergy tested. non-comedogenic. non-acnegenic. fragrance free. sensitive skin tested. Product packaging may vary. Ingredients: Active ingredients - Titanium dioxide 6.8%. Inactive ingredients - Water, undecane, dimethicone, glycerin, tridecane, polyglyceryl-4 isostearate, pentylene glycol, cetyl PEG/PPG-10/1, dimethicone, hexyl laurate, magnesium sulfate, disteardimonium hectorite, trihydroxystearin, cellulose gum, aluminum hydroxide, disodium stearoyl glutamate, acetylated glycol stearate, acrylates copolymer, ethylhexylglycerin; may contain: titanium dioxide, iron oxides. If you have any questions about this product by Dermablend, contact us by completing and submitting the form below. If you are looking for a specif part number, please include it with your message.